One of the biggest fears that not only holds entrepreneurs back from starting their business, but often haunts them throughout their career, is the fear that they are not good enough. If that’s how you’re feeling right now – it’s OK, you are far from alone. When I started my first business, an Internal Communications Consultancy, the question ‘Am I really good enough?’ was constantly on my mind. Luckily it never stopped me going ahead anyway since I decided that ‘…there’s only one way to find out!’ was my best response. If you are starting a business and are currently sat in that hamster-wheel asking yourself: “Am I good enough?” here are the steps to follow to help you get back on solid ground and start moving forward. First things First – Why do you think you’re not good enough? Often our doubts and fears are untrue and based on outdated events and experiences – but occasionally they highlight an area that we need to work on or be aware of. Where is your doubt coming from? If it’s telling you you need to get more skills or experience – great, find out what you need, where to find it and go out and get it. But, if it’s “just saying…” and there is no hard evidence to suggest that you may not be up for the job – then you can put your doubts to one side, take a deep breath and move on. As a conscious business person, who wants to get the best results their clients, it’s natural to ask if you are good enough – and for most people just the fact that you asked shows that you are! In this case, you can use your fear to help you stay focused and do your best work. Do that, and you’ll no longer have time to wonder if you’re good enough! It’s useful here (some might say essential!) to put your ego to one side and remember that your business is not about you, it’s about helping your client. The only way you will really let them down is if you let your fear get in the way of helping them. So don’t! Filling your mind with positive thoughts is one of the fastest ways to irradiate fear. Look back over your Success Journal to remind yourself of all the great things you’ve done in the past and the challenges you’ve risen to. If you don’t have a success journal already, then take a moment to cast your mind back to another time when you worried you weren’t good enough – but then went out and did a great job. Track down an inspirational business book, podcast or video and read or watch for at least 10 minutes to help fill up your mind’s positivity banks. It’s a great way to remind yourself that anything is possible and you can do this! Why did you consider starting a business? Was it to use your talents to improve the lives of others? Was it to give yourself greater challenge so you can discover and reach your full potential? Maybe it was to start earning what you are truly worth, and not what someone else thinks you’re worth. Whatever your reason, you are never going to achieve it by getting scared and giving up at the first hurdle. Instead, use your energy to make a plan to move you and your business forward. Start by identifying the worst-case scenario – what would really happen if everything goes wrong? Then look at your best-case scenario – if everything goes perfectly, what would that look like? Now compare the two. In most cases, the best-case scenario is also the most likely one. Putting them both down on paper can help you think more logically about the decision you are really making and what’s at stake for you and your business. Using your plan and your new-found focus, start proving to yourself that you can do the job by taking action. Once you have, remember to celebrate your success – even the small wins – as this will help motivate you towards your next success. Then write about your success in your journal to help you the next time you ask yourself ‘Am I really good enough?’. Then rinse and repeat. The next time you question if you are good enough, follow the same steps to move forward. The more you practice, the more you will push your comfort zone and grow in confidence. It’s likely that as you continue to learn, grow and step into your full potential, you’ll start facing bigger and bigger business challenges – but the steps to overcome your fear are always the same. The more you do it, the more you will find yourself willing to take on in the future. And that, my friend, is going to consistently take you in the direction of your dreams and beyond. The flip side of being fearful is being confident. So it’s helpful to understand that confidence is dynamic. This means that questions like ‘Am I good enough?’ are not going to go away, despite you getting more experience and business success under your belt. You may enjoy success in one scenario only to feel fear in a similar, but slightly different, scenario in the future. For example, you give a talk in front of your colleagues, you are nervous but you succeed. This doesn’t, however, stop those feeling of not being good enough reoccurring when you come to give the same talk in front of a different audience. The only difference the second time is that you know that the fear is temporary and that you can do it. Continue to follow the steps above and practice overcoming fear, and you’ll soon learn how to ‘feel the fear and do it anyway’. Set yourself up for business success by creating a work environment that puts you at ease and helps you to feel in control and capable. You may find it helpful (and fun!) to experiment with different working locations. Think about who you surround yourself with. You become like the five people you hang out with the most, so make sure that these are inspiring and successful people. I remember Bob Proctor talking about how he wanted to do better in life, but then realized that he often sat in a bar surrounded by deadbeats – as soon as he changed and started to associate with successful people, he was able to see himself as being capable of more business success too. It’s also important to guard what you put into your mind. If you watch trashy TV and spend hours a day finding out what child celebrities look like today, you are already downgrading what your mind will feel is possible for you. Instead, as mentioned above, spend at least 10 minutes a day filling your mind with tips and inspiration from business success and self-development books, videos and podcasts. So to feel ‘good enough’ more often, it’s ‘Out’ with the negative influences and ‘In’ with everything positive. It’s really important for entrepreneurs to practice self-care and respect. If you don’t believe in yourself, then no one else will take you seriously either. I learned the hard way that business success and healthy living go hand in hand! Be sure to eat well, exercise, meditate and build your skills and happiness every day. These actions will also serve to regularly reinforce your feelings of being more than good enough. When he had a near-death experience, Brendan Burchard found himself asking. “Did I live? Did I love, Did I matter?”. Don’t wait for the end of your life to ask these questions, instead, step up each day, look for opportunities to go ‘above and beyond’, try new things, go to new places and meet new people. You owe it to yourself, and the rest of the world, to tackle your fears, put your talents to their best use and live a full, exciting and meaningful life. Business success lies in your daily habits, and consistent action builds confidence, so moving forward every day, even in some very small way, is going to make all the difference. It all starts with that first step! If you are considering starting your own business, or are looking to take your business to the next level? You can by-pass much of the fear and achieve your goals faster with a coach by your side – you’ll also have more fun! …and if you are wondering where you might find a business success coach – ta-da, here I am! I’ve created the ‘Your Business Blueprint to More Dream Clients’ program especially for you. It’s a 90-day private business-coaching program to help female business owners go from idea to business, or from new business to thriving business. As well as building your blueprint to lasting business success, I’ll help you gain clarity so you always know what to do next; help you learn essential business skills so that you can continue to build your business beyond the program; and help you build your business confidence. Sound interesting? Contact me to request your 30-minute Discovery Call. What have you done to help you get over the “I’m not good enough” doubts? What challenges have you overcome using any of the above methods? Share your thoughts, experiences and ideas in the comments section below! I think having a plan is one of my biggest ‘secrets’ to success. Even the biggest goals become so much more realistic when they’re broken down into more manageable steps. Thanks Aditi. And you’re right, we have to take responsibility for our own situation – but it can be beneficial to have inspiring people around you to help you through. Such a good post and so many of the tips rang bells with me. Thank you for sharing it. Thanks Debrah, I’m so pleased you found it helpful. I struggle with this so much. It feels good to know I am not alone! I think it’s time for me to take a deep breath and move on. Great article, and thanks for all the advice. Yes, go for it Denise! Great article. Controlling your influences is a big one! You’re right Ashley, it is, and it’s something most people pay little attention to. What a great post! Thanks for sharing so many helpful tips. I especially love that you pointed out that the only way we will let people down is if we let our fear get in the way of helping them. Thank you! Thanks Martin, I’m so happy you enjoyed it. Wonderful advice! 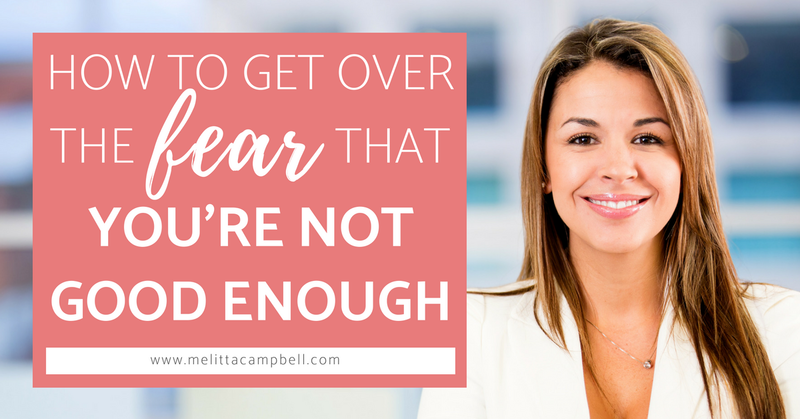 I’ve had my own battles with the fear of “Am I good enough” as I transitioned through various careers and then ultimately moved up the career ladder, and then into some entrepreneurial avenues as well. A lot of the advice you’ve shared are the things I had done over the years to vanquish my fears and become more confident in myself and my ambitions. I also think an interesting thing about this feeling of self doubt is that it’s truly self generated. Our brains often worry more than is actually required, and if we can rationalize our feelings and pull them into reality, we can often begin to see our fears or doubts are just a figment of our imagination and not something we should let hold us back! Thanks for sharing your experiences Frank. I think you’ve touched on an important point there too. If we are feeling fearful, it’s usually because we are focusing too much on the future, and not enough on the ‘now’. There is no fear in the present moment, only when we think of what might or might not happen in the future. Trouble is, we can never really predict the future and more often than not, what we fear never happens – so we waste energy and hold ourselves back for no reason. It’s important to have a plan for the future so you know what direction you are going in and what step to now and next, but don’t worry about the outcomes, just trust that if you are doing your best right now, the future will take care of itself. Thank you for this post. I’ve been searching Google in the past few days on how to deal with the fear of not being good enough. Turns out this is one fear that has crippled me in many ways. This your article will be my starting point. I’m so pleased that you found this article helpful Grace. As you say, this fear can really cripple you and stop you fro discovering the greatness you have within you – the key is to get out there and start taking action to prove to yourself that you are more than good enough. Start with small things that feel doable, then as you gain confidence, opt for new challenges that will push you to grow. I feel like this so many days when it feels like people don’t look on my site. Then I need to remind myself that I just started and It will grow. If others can, I can make it grow too! Thanks so much for this post! It is amazing and it deserves tweets and saves. I guess that fear holds us back just because it knows that we will be good… But I believe that we have the power to push it away. You’re right, your fear is showing you that you want to deliver a great experience for people. There’s a great saying: “Marry the activity, divorce the results”. As long as you are consistently taking the right steps (see the post ‘Finding Clients’ for some tips here), then the results will come, but they may take some time. That said, it’s wise to monitor your results so you can make any needed tweaks along the way, but don’t obsess over them. Wonderful tips, I find “control your influence” especially eye-opening. Thanks for sharing! Thanks Tamara, I’m glad you found it helpful. I love that you picked out the ‘control your influences’ point as it’s something that people often overlook, yet it can be so powerful. Thank you for this article, very helpful! I like the ‘fill your mind with positive thoughts’. That’s what I do with any fears. Thanks for sharing your feedback Laura, great to know that some of the tips work well for you. You’re welcome Sheila, I’m so happy you enjoyed this article.